Location is great and customer service team is helpful. Amazing stay and service by the staff. Well maintained rooms, pool, gym and sauna. Enjoyed the stay. Kitchen sink and stove top space is bit small. But manageable for short stays. The receptionists were accommodating especially Riza and Rajim who lend me a million of patience whilst talking to them. Thank you guys, you did a great job. Keep it up! I'll promise to be back soon. Btw, I booked the room as a wedding gift. Necessity things like hair dryer, flat iron, washing machine,etc....are almost available in the room. lovely rooms, got the corner suite. 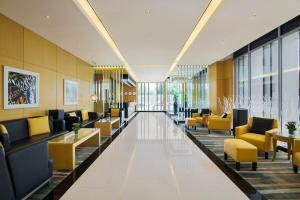 Friendly staff, close to local amenities malls and other hotels. THis is a "dry Hotel" but that is not an issue, hotel next door is wet. I like everything.from the staff to facilities. The access to grocery and food delivery.since I can't go down to the lobby to get the food they brought it to me. good space of room and location. Warm water for swimming pool. 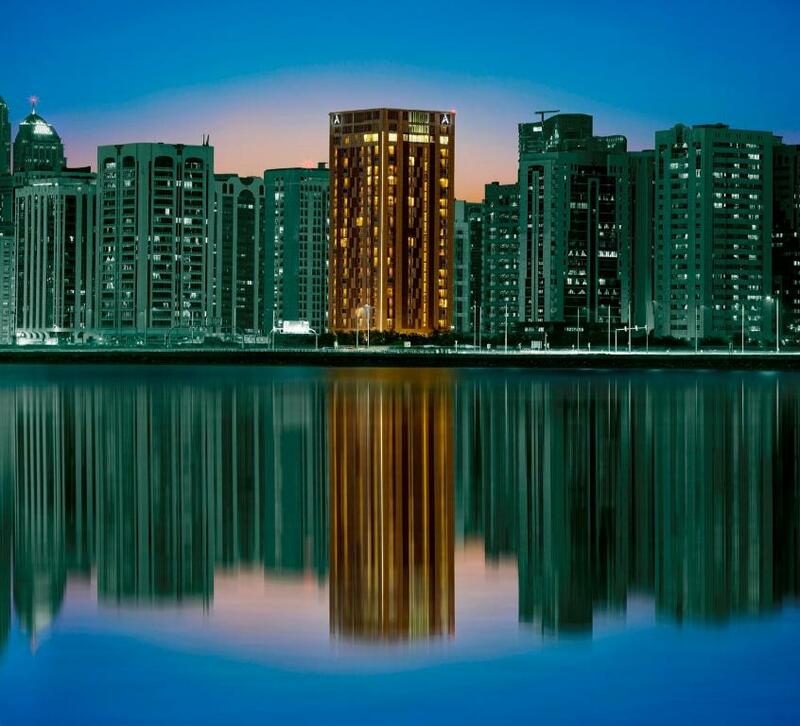 Lock in a great price for Hala Arjaan by Rotana, Deluxe Hotel Apartments – rated 8.4 by recent guests! 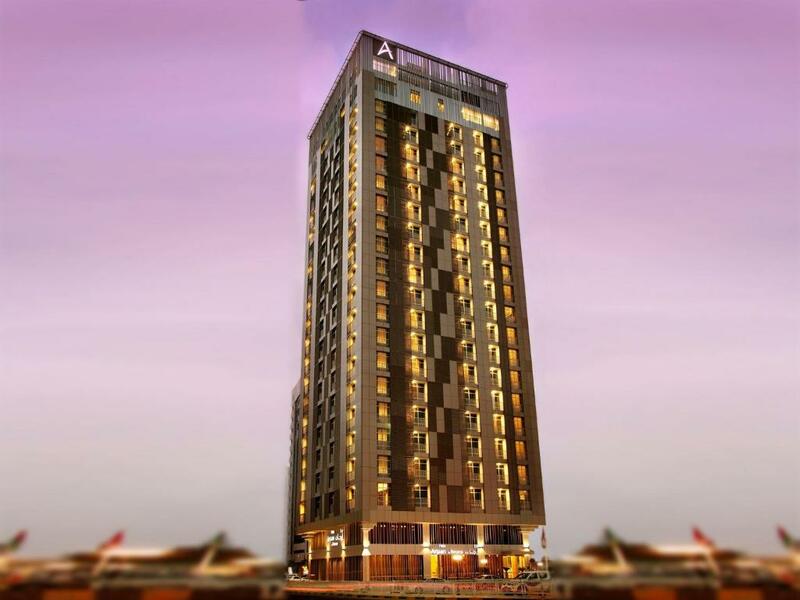 With panoramic views of Al Maryah Island and Abu Dhabi city, Hala Arjaan by Rotana, Deluxe Hotel Apartments offers contemporary furnished and fully equipped hotel apartments in the middle of Abu Dhabi. Guests can enjoy free WiFi throughout the property. The spacious, air-conditioned rooms at Hala Arjaan by Rotana, Deluxe Hotel Apartments have modern furnishings, a large satellite TV and a spacious seating area. The kitchenettes feature a microwave, refrigerator and a tea/coffee maker. The Gallery is an all day dining restaurant that offers a breakfast buffet and an a-la-carte menu for lunch and dinner. It offers a large variety of favorites in the in-room dining menu as well. The Rooftop Aquarius Pool Bar offers a wide range of fresh mocktails and delectable appetizers. Bodylines Fitness and Wellness Club includes a rooftop indoor temperature controlled pool, a state-of-the-art fitness center along with the sauna, steam and massage center that Hala Arjaan has to offer. 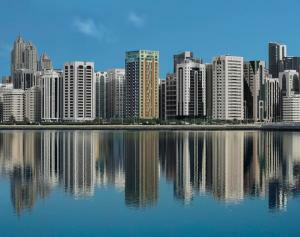 Abu Dhabi Mall is a 5-minute walk from Hala Arjaan by Rotana and Al Maryah Island is a 2-minute drive. Corniche beach and Saadiyat Island can be reached in 5 minutes and Yas Island and F1 Yas Marina Circuit are just a 15-minute drive away. Parking space is offered to all residing guests (subject to availability). When would you like to stay at Hala Arjaan by Rotana, Deluxe Hotel Apartments? Warmly decorated 40 sqm studio with king size bed. The studio offers a spacious seating area and city view with a balcony. 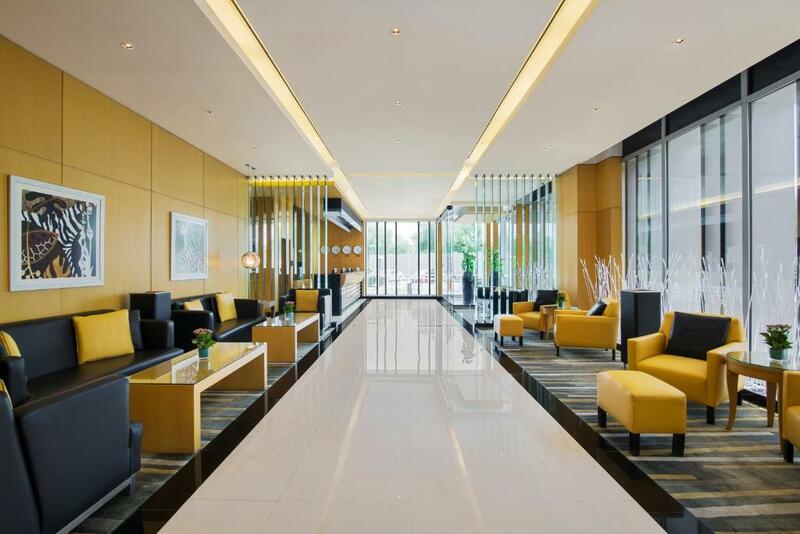 Additional features include a kitchenette with refrigerator and washing machine, LCD Screen TV, designated office desk and sofa with coffee table, laptop safe box, and wireless internet. Stay in the 85 sqm classic suite and experience absolute pleasure. Distinctly decorated, the suite features a separate living room and bedroom with king size bed. The apartment is equipped with individually controlled air-conditioning, spacious marble bathroom, fully equipped kitchen with washer/dryer, dining table for four, designated office desk, two LCD TV screens, wireless internet and a balcony with city view. Deluxe studio measuring 40 sqm with twin beds. The room includes an open kitchenette including a washing machine and a dryer. The bathroom is laid with marble and has a walk-in shower with deluxe amenities. Guests can enjoy the bliss of the city view with exclusive balconies featured in the rooms. The exquisitely furnished 195 sqm penthouse with two bedrooms features luxury and comfort with two spacious marble bathrooms, fully equipped kitchen with washer/dryer and dish washer, large dining table, designated office desk, 3 LCD screen TVs and large balconies over looking both the city and Al Maryah Island. Enjoy feeling comfortable and at home in the premium suites offering 85 sqm of living space. The one bedroom apartment features marble mosaic bathroom, a state of the art living room with ample sitting. The open furnished kitchen includes full refrigerator, hot plate, microwave oven, dishwasher, washing machine and dryer, crockery and cutlery, and coffee making facilities. 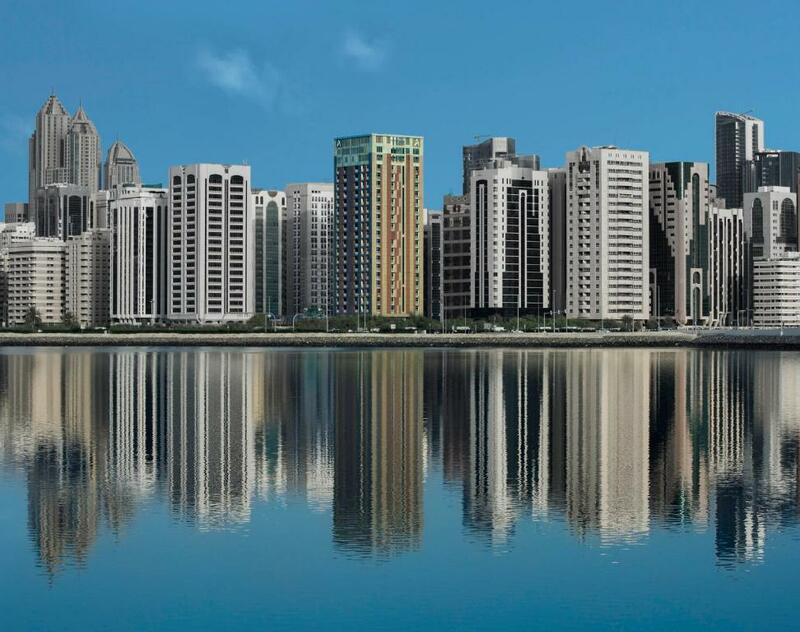 Featuring a panoramic view of Al Maryah Island, this premium studio is decorated with modern furnishings. It includes a living area and a kitchenette with a washing machine/dryer and kitchenware. Featuring a panoramic view of Al Maryah Island, this premium room is decorated with modern furnishings. It includes a kitchenette with a washing machine/dryer and kitchenware. Strategically located on Hamdan Street, Hala Arjaan by Rotana is a deluxe hotel apartment for business and leisure travellers. Situated in the heart of the business district, the hotel is within walking distance of some of the capital's most famous landmarks and attractions. Hala Arjaan by Rotana has 166 rooms featuring comfortable furnishings and modern conveniences fulfilling guest's expectations. Choose to check-in to one of the six categories of rooms nestled in 19 floors with perks like free Wi-Fi access, plush bedding and marble bathrooms. Every room includes a spacious fully equipped kitchenette for the comfort of the long as well as short staying guests. A trendy all day dining offers buffet breakfast and an appetizing a la carte menu for lunch and dinner. Guests can enjoy 24 hours dining in the comfort of their rooms. The deluxe hotel apartment also offers a state-of-the-art Bodylines Fitness and Wellness Club which is a haven for relaxation. The staff at Hala Arjaan by Rotana is warm and friendly. 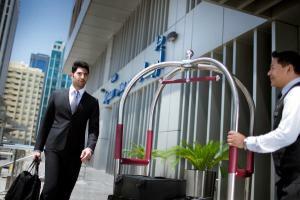 They promise the best services and are multilingual, skilled in their area of expertise. Situated in the heart of the business district, Hala Arjaan by Rotana is within walking distance of some of the capital's most famous landmarks and attractions. Located in Al Zahiya (also known Tourist Club Area), Abu Dhabi Mall and the beautiful Corniche are a short walk from the hotel while Al Maryah Island and the iconic building of Cleveland Clinic Abu Dhabi are a stone's throw away. Major attractions at Yas Island are a short drive and travellers can reach Abu Dhabi International Airport in just 30 minutes. 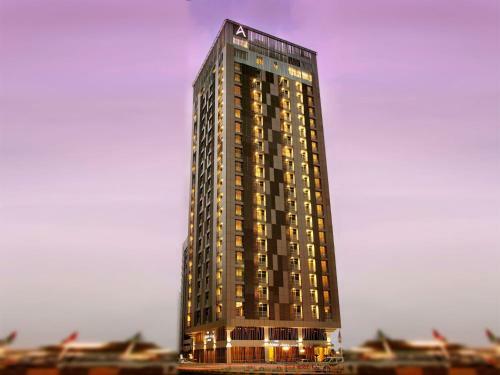 House Rules Hala Arjaan by Rotana, Deluxe Hotel Apartments takes special requests – add in the next step! Hala Arjaan by Rotana, Deluxe Hotel Apartments accepts these cards and reserves the right to temporarily hold an amount prior to arrival. An additional deposit will be required upon check-in to cover incidentals charges. Please note that there is an additional 15 AED tourism fee per room per unit per night payable at the hotel directly. 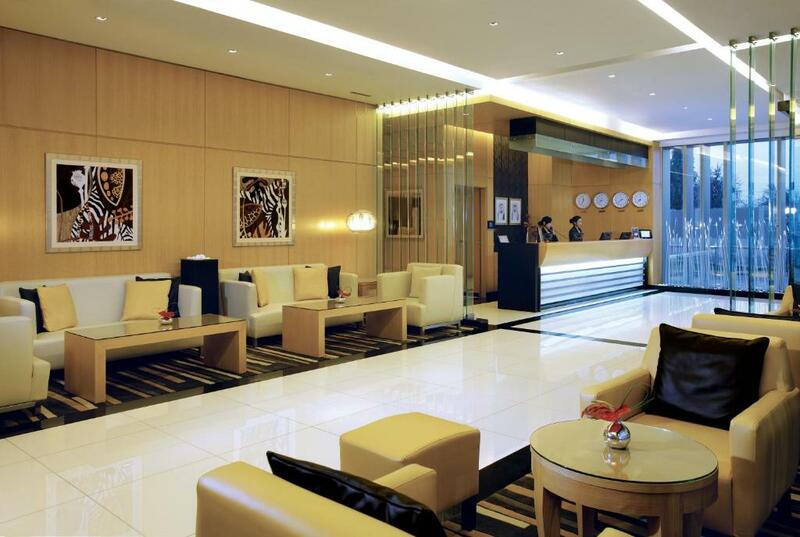 Kindly be informed that 30 AED destination fee per night will be specifically for Penthouse Suite only. Breakfast not as varied as it was about a year ago. Not as much variety. Hence a little flat. I would prefer to find slippers, luffah without requesting. Havent got shaded or under ground parking. I feel at home here. This is - so far- my favourite place to stay in Abu Dhabi, full stop. Very nice one bedroom apartment, very spacious and with some equipment provided. I had an issue with noise due to the pool and they changed the apartment for me. Fast and efficient check-in, kind staff. Nice and practical layout of the room, well-equipped and functional kitchen and bathroom, good strong shower. Nice breakfast space on the 1st floor, selection is not huge but perfectly sufficient, food fresh and tasty. Also the hotel has parking spaces separated with a barrier from the public parking slots so it's quite convenient. I was charged twice due an error on the hotel credit card reader. It gave a false message that the transaction was declined, when the charge was accepted by my bank. Had to provide a different credit card and I was charged again. We have limited time to enjoy other facilities, but I noticed single sofa is not enough ....better to have 2 seater sofa instead inside the room. the bathroom could have been a little cleaner.